One of the best defenders in the game ever, Bobby Moore, started his career in West Ham United and made his league debut for them as a 17 year-old. He won his first England cap just weeks before the 1962 World Cup and impressed enough to gain a place in the squad that travelled to Chile. Bobby played in every match as England reached the quarterfinals and made the number 6 jersey his for the next decade and more. His ability to tackle and read the game compensated for his lack of pace. His positioning and passing ability made him an asset also in the offensive part of the game. He was a gentleman on and off the field and a true leader which made him win the England captaincy at an early age. He kept it for 90 of his 108 matches equalling Billy Wright’s record. Bobby’s contribution to England’s 1966 World Cup victory was immense. England didn’t concede a goal until the semifinal when Eusebio scored on a penalty. 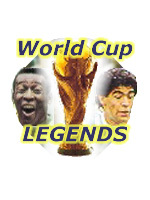 As a proud captain, he could receive the World Cup trophy from the Queen after a dramatic final against West Germany. The mid sixties was a time when Moore also had success with West Ham. Not only was he voted England's Player of the Year in 1964, he also helped them win the FA Cup and the European Cup winners' Cup the following year. The league championship was the one trophy he never won. England travelled to Mexico to defend their World Cup title in 1970. Bobby was as classy as ever and confirmed his greatness especially in the match against Brazil when England lost 1-0. Just a couple of weeks earlier he had been accused for stealing a gold bracelet and put in jail for four days. He wasn’t declared innocent until weeks after the finals. Bobby did not let it affect his play, but West Germany got revenge for the Wembley defeat in the quarterfinal and won after extra-time. 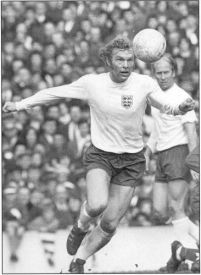 Bobby Moore played his last game for England in 1973, a 1-0 defeat to Italy at Wembley, and retired in 1976 having played his last three seasons with Fulham. He later played in America for Seattle Sounders, but he never succeeded as a manager despite trying at Southend and Oxford. He was struck by cancer in 1991 and died two years later at the age of 51. One of his few true rivals as 'the best defender ever', Franz Beckenbauer said of him: ” Bobby was my football idol. I looked up to him. I’m so proud to have played against him ”.